← Enough: Ending The Violence! Today, if either by birth or by participation, we are part of a Christian church of some sorts, then you can call yourself a “Christian.” If the government mails out a census asking about our religious preferences, we can check the box that says “Christianity” and that identifies us as a Christian. Of course, none of this means that we are necessarily bound to live by any certain set of beliefs and values to be regarded as a Christian. It was very different during the middle part of the first century. As this Jesus movement emerged, those who joined the movement were believers and disciples. They were believers but not just believers in some creed. They were people who heard “the good news about the Lord Jesus” and as a result “believed and turned to the Lord” (Acts 11:21). That is, they not only believed in Jesus as Lord and Messiah but also believed in his way of life, embracing it as their way of life. Consequently, when Barnabas arrived among these believers in Antioch, “[he] saw what the grace of God had done…” (Acts 11:23). This is how these believers became disciples. Of course this was the work of God among them, yet what Acts 11:26 tells us then is that they were identified as Christians because they were disciples of Jesus Christ first. To identify these believers as “Christians” would be the same as being identified as “Messianists” (Luke Timothy Johnson, The Acts of the Apostles, 205). 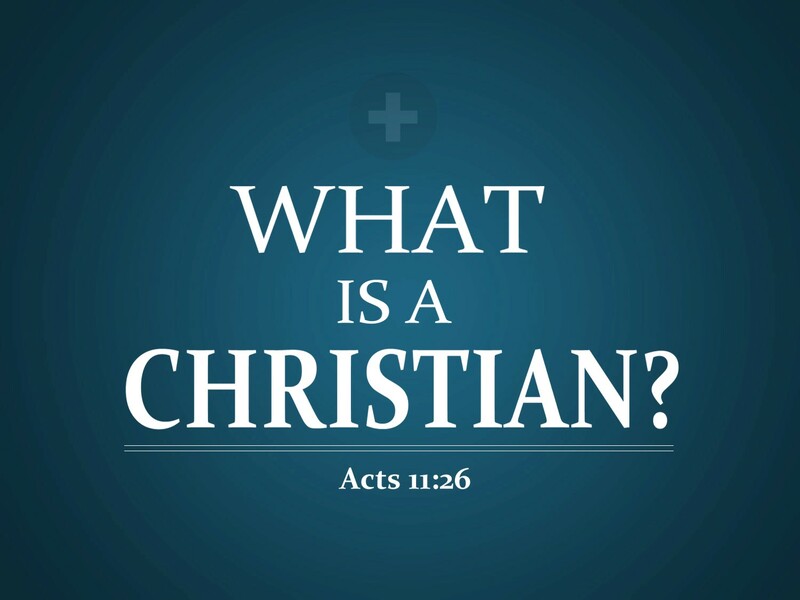 Whether we speak of them with the Greek/Latin term “Christians” as the book of Acts does or with the Hebrew term “Messianists”, such identity is due to their devotion to following Jesus as believers in Jesus and his way of life. The irony in then and today is this: Then people were identified as Christians because they were committed disciples. Today people can identify themselves as Christians and not necessarily have any commitment to living as a disciple of Jesus. This entry was posted in Faith, Kingdom of God, Scripture, Theology. Bookmark the permalink. In today’s world calling oneself a “Christian” more or less implies belief, not necessarily belief with action. Yes, what happened is that Christianity shifted from a way of life to a set of beliefs that need not necessarily have anything to do with the way life is lived. I think there’s more to it. I think the mixing of Jews and Greeks forced people to see them differently. No longer was this some Jewish sect; this was a new group. There is nothing more Christian than the breaking down of barriers between people. Yes I realize there is more to it (I’m waiting for someone to respond with “what about repentance and baptism”). I just wanted to emphasize the fact that they were identified as Christians because of their becoming disciples. But I do agree with you that the breaking down of social barriers is part of that discipleship. So, my friend, are you trying to bait one of us “modern” Christians into asking about repentance and baptism? I would say that “repentance and baptism” is, and has always been, just the starting point. It was never meant to be the ending point, but, unfortunately, that is what many “Christians” practice. The Restoration movement would never teach “once saved always saved” but is it guilty of practicing it? No worries…I believe repentance and baptism is part of becoming a disciple. I emphasize the becoming a disciple because I know of some people, as I am sure most Christians do, who have repented and been baptized but have never become a disciple. There is something wrong with that. Could it be that scripture wants us to see is that while repentance and baptism are necessary to becoming a disciple, we become Christians not by repentance and baptism but by becoming disciples? The word repent does not just mean being sorry, confessing sins, or confessing “faith”; it especially means turning away from sinful beliefs and actions, and turning to God and acting differently. When Jesus–as the Christ, the anointed king–commands repentance, he is calling people to live differently by becoming his disciples and entering his kingdom. Moreover, repentance is also an ongoing discipline: daily rejecting the wisdom and ways of the world (including many of its “Christians”), and turning to Jesus Christ for a life of true wisdom. Agreed. Such repentance is exactly what is in mind when the text says that these people in Antioch “believed and turned to the Lord” (Acts 11:21). If we as Christians are not about our business of pointing people to the Lord, then, don’t u think, few will turn to Him and become disciples according to His purpose 4 them? Jesus came to save the world, He did not come to judge it.(Jn. 1:47) . . but Christians from every denomination seem to believe He sent them to be the judge on His behalf . . . such a sad commentary of Christianity today, IMHO!